The Walker Library’s User Services Department offers librarian-led instruction sessions to support student learning at MTSU. User Services faculty work with instructors to design curriculum-integrated and assignment-based lectures, workshops, and research guides for face-to-face and online classes in order to teach students how to become active and responsible participants in scholarship, academic research, and creative projects. Information literacy is the set of integrated abilities encompassing the reflective discovery of information, the understanding of how information is produced and valued, and the use of information in creating new knowledge and participating ethically in communities of learning (Framework for Information Literacy for Higher Education, 2015). 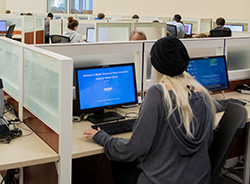 Students will recognize the various services and areas within the physical library building in order to locate service points, choose appropriate study areas, and identify where they can get help. Students will be able to navigate the library’s web site in order to successfully locate a book and a periodical article. Students will be able to search a database using flexible vocabulary in order to retrieve articles that are on-target and topic-relevant. Students will be able to distinguish between different types of information sources (e.g., books, popular magazines, and scholarly journals) in order to select material to support their argumentative writing. Students will be able to evaluate information sources in order to judge their relevance and appropriateness for their argumentative writing. Students will be able to search a database using flexible vocabulary in order to retrieve current events articles that are on-target and topic-relevant. Students will be able to evaluate information sources in order to judge their relevance and appropriateness for their persuasive speeches. Students will be able to select and manipulate subject-specific databases in order to locate relevant sources for their historical research projects. Students will be able to distinguish between primary and secondary sources in order to select and evaluate appropriate materials for their historical research projects. Students will be able to select and manipulate subject-specific databases in order to compose a literature review in their selected discipline. Students will be able to describe the scholarly and/or trade publishing environment for their discipline in order to evaluate the authority and credibility of information sources. Students will be able to use interlibrary loan in order to extend their searches beyond MTSU’s collections. The James E. Walker’s User Services Department at Middle Tennessee State University assesses student learning in the library instruction classroom through a variety of assessment techniques. Additionally, the department continually assesses its overall library instruction program through faculty feedback, peer observation, and self-reflection. Library instruction contributes to student success by providing students with the knowledge practices and dispositions to support their classroom learning, research, and creative projects. Student learning outcomes are assessed through both formative and summative techniques. Classroom Assessment Techniques: Student-led presentations, in-class Q&A, exercises, worksheets, classroom response systems, goal setting (e.g., “Find three relevant articles…”), etc. In-class student surveys & reflection prompts for recording student responses in selected classes. Online tutorials: Searchpath information literacy lessons, Credo pilot information literacy modules, etc. Faculty surveys ask faculty to assess the impact library instruction has had on their students’ end-of-semester work. Distance learning student surveys measure the effectiveness of Embedded Librarians in online and hybrid classes. Lower Division English and Communication Studies each conduct their own TBR-mandated assessments of student learning. These include assessments of how students integrate independent research into their work in ENGL 1020 and COMM 2200 respectively. These assessment results are regularly shared and discussed with User Services librarians. The National Survey of Student Engagement’s (NSSE) Information Literacy Module. MTSU’s Office of Institutional Effectiveness, Planning and Research disseminates NSSE results. Standardized Assessment of Information Literacy Skills (Project SAILS) exam, Fall 2009. Research study on library instruction and GPA correlations (Vance, Kirk, & Gardner, 2012). Analysis of library instruction program statistics allows the department to measure the number and variety of classes that receive library instruction, librarians’ saturation rate for specific high-impact classes, and librarians’ workload distribution. Faculty end-of-semester surveys include questions about the overall effectiveness and delivery of library instruction. The User Services Department has a voluntary Peer Review of Teaching process in place for librarians who want to get peer-feedback on their classroom teaching. Library instruction teaching reflection forms are sent to librarians after they teach to record and collect post-class reflections and collect copies of assignments. The Information Literacy Faculty Advisory Group is a group of interdisciplinary faculty who meet a few times each semester to provide the library with a faculty perspective on library instruction and information literacy initiatives.